“Sea creature fantasies” is part of “Let’s Get Acquainted” premier Artisan Nail Glaze Collection made by Domani Color. It is a blue green sparkly goodness, with iridescent color shift sparklies, shifting from gold, to green, to blue. Depending on the type of application, 2 to 3 coats might be required for full coverage. Color Blue green sparkly goodness, with iridescent color shift sparklies, that shift from gold, to green, to blue. Although we know mermaids do not exist. Well, not in the manner that it has been fantasized. Real mermaids, if they do exist, appear to be hideous creatures living in the ocean. 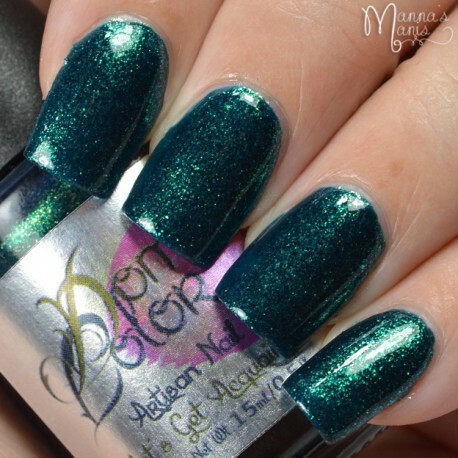 However, when you get this on your nails... the beautiful mermaid fantasy comes to life, and stays alive, at least while you keep this polish on your nails! “Sea Creature Fantasy” is completely cruelty-free, Vegan friendly, and 5-free making the product safe for everyone’s use and safe for the environment.